• 30+ MALES LOOKING TO GET BACK INTO SHAPE! Salford Clinical Commissioning Group have provided funding for the Foundation to deliver our Tackle Men’s Health programme which also includes our Touch Rugby League. 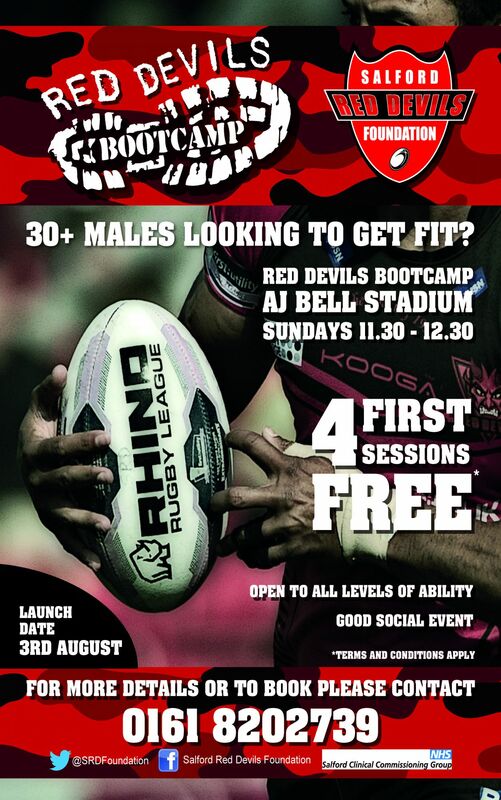 Visit www.salfordreddevilsfoundation.co.uk for more info on the Touch Rugby league programme. Our Tackle Men’s Health programme aims to increase physical activity levels amongst Salford males aged 30+ encouraging healthy behaviour changes. All you need to do to see if you qualify for the FIRST 4 FREE SESSIONS is contact Joanne to see if you meet the criteria.